God is in the delivery business. I know, in the past I have said that He is in the “Family business: saving souls” but this is still a branch of the family business! We recently started a business of our own. 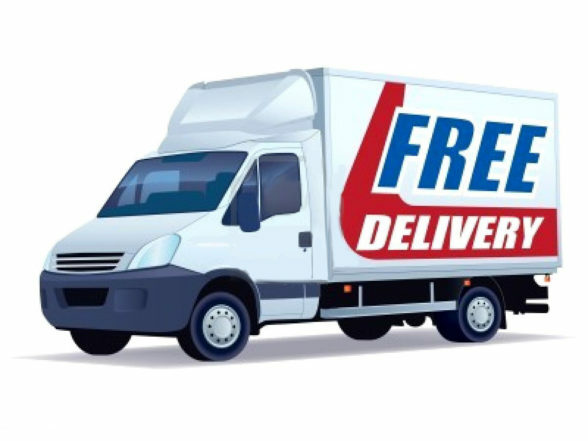 We specialize in expedited (you needed it there yesterday) delivery. People contact us because they have a load that the customer wants ASAP and we can get it there fast in our little sprinter van. So maybe I have had delivery on my mind. However, the month of January our church always goes on a corporate fast (and prayer time). During one of those times of praying and listening, this thought popped into my head, “God is in the delivery business” followed by this scripture in Colossians. Soon I couldn’t even stop the thoughts that bombarded me. I am going to share a few. I am sure there is more to be found. I sure love to think of the Father hand delivering all of these wonderful things to me. A personal gift. Free of charge. Now, our company, JW Expedited LLC, delivers for money, our purpose and motivation is to please the customer so that we get paid well. The world has a totally different idea of wisdom than God. The world see’s wisdom as intelligence and knowledge. In fact the Encarta Dictionary uses these definitions: good sense, wise decision, accumulated learning, opinion widely held, ancient teachings or sayings. I can right away see problems with all of those definitions! Good sense, we all need some of this, but if it isn’t based on the Bible, it isn’t good. The same can be said for a wise decision, if a decision is based on the world’s view of what is wise, the motivation will be greed, or lust, or it will be based on flawed thinking. The Bible tells us that knowledge puffs up, or gives us a “big head” so accumulated learning will only fill our heads with knowledge that we won’t be able to apply to our lives in any meaningful way. Even knowledge of the Scriptures without Godly wisdom will not profit us. Any opinion widely held is changeable. For example at one time people thought that eating the potato would kill you, and that the world was flat, need I say more? Lastly, ancient teachings can be wise, if they line up with God’s word, otherwise they are still opinions of man that happened to be spouted off years ago. God tells us that wisdom from heaven is first of all pure. Godly wisdom isn’t motivated by anything other than love. Next, from our verse in James, we see that it is peace-loving and considerate. This kind of wisdom isn’t putting “self” first. It doesn’t have to have its own way, or demand its rights. It thinks “more highly on the things of others.” Wisdom from Heaven is submissive. I know we Americans tend to hate that word, but only because we don’t understand what it means. Submission simply means being “under a mission.” I am under the mission of God. His mission is to bring everyone to the saving knowledge of His grace. I submit to that mission. If we are using Godly wisdom there will be fruit, we will show mercy to others. God is merciful. He never gave us what we deserved, but only what would bring us to a place of fellowship with Him. Finally, this kind of wisdom is impartial and sincere. It can’t be faked. The world is full of people who see themselves as wise. They spout off information, statistics, and opinions and expect us all to be wowed by their greatness, which is neither impartial nor sincere. You can’t fake Godly wisdom, ever. Godly wisdom’s purpose isn’t to impress anyone. It’s purpose is to further God’s Kingdom here on earth. So, maybe you aren’t feeling too wise right at this moment. Thankfully, God has an answer for that as well. I think it is safe to say that the way the world thinks to acquire wisdom is through learning, and through osmosis. We, on the other hand, as Children of the Almighty, receive wisdom from God. It is a gift. We can’t earn it, but that doesn’t mean that we just sit and wait for God to deposit wisdom into us either. God always has a part for us to play. One of the ways that God imparts wisdom into us is through His word. A great place to obtain Godly wisdom is in the Proverbs. He also uses sound teaching. We need to know God’s word and how to apply it to our own lives. This is wisdom. Why do we need wisdom? And what do we do with it? Godly wisdom loves, it saves souls, inherits honor, shines like the brightness of heaven. So, get wisdom! It’s important, but make sure it is the wisdom from Heaven. Daniel was a ‘wise-hearted’ man. Joseph was a ‘wise-hearted’ man. Moses was a ‘wise-hearted’ man. All of these men proved the wisdom God had placed in their hearts when they each had to face the so-called-wise-men of their day. When the wise men of Babylon couldn’t decipher Nebuchadnezzar’s dream, Daniel did. When Pharaoh’s wise men couldn’t interpret his dream, Joseph did. When the wise men of Egypt mimicked the miracle of God and turned their staffs into snakes, Moses’ snake ate theirs. Apart from the power of God, what is the difference between wise-hearted and wise-headed? The wise men of the world are depending on their five senses, what they can hear, taste, touch, feel and see. But our senses can deceive us. They operate out of their minds, their heads. The heart is the place of truth. The heart believes! It doesn’t even need the bodies senses. We can’t obtain salvation through our minds, only through our hearts. We can’t understand God’s word with our minds, only with our hearts. We can gather facts with our minds, God gave us wonderful brains, but it is through our hearts that we act on what we know. So who is a wise-hearted man? Someone who by-passes their head and believes in their heart that God is good! That He is on our side! That His word is true and He will do what He says He will. 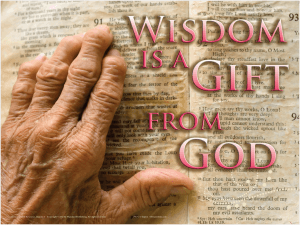 God established wisdom and, boy, do we need it! Reverencing God is wisdom. We can gather facts and cram our brains with knowledge, but that only ‘puffs up’, or makes us arrogant and fills us with pride. We all know at least one person who is a “know-it-all” and how much fun are they to be around. Try to impart some new information to them, or even give advice. Those kind of people are not teachable because they aren’t humble. But then we all know “wise” people, who may or may not have a lot of facts stored in their brain, but they can give and take advice, they are teachable. So we don’t need facts alone, we need to know that to do with those fact. Facts alone are dangerous. Ecclesiastes 7:11-12 “Wisdom, like an inheritance, is a good thing and benefits those who see the sun. Wisdom is a shelter as money is a shelter, but the advantage of knowledge is this: Wisdom preserves those who have it.” Wisdom helps us apply facts in the right way. Godly wisdom keeps us from screwing up. We are blessed when we find wisdom. “Blessed is the man who finds wisdom, the man who gains understanding, for she is more profitable than silver and yields better returns than gold. She is more precious than rubies; nothing you desire can compare with her. Long life is in her right hand; in her left hand are riches and honor. Her ways are pleasant ways, and all her paths are peace. She is a tree of life to those who embrace her; those who lay hold of her will be blessed.” Proverbs 3:13-18. What is in her hands? Long life in one, and riches and honor in the other. Sounds good to me. Ok, so that sounds a bit silly. Wouldn’t we all try our best to convince them that there is help and hope for their recovery! Now let’s flip that to the spiritual. You have a brother or sister who begins to slip, maybe even sin…Would you not want to point out to them that they are heading down the wrong road, that there is help and hope for them? We can’t get all holier than thou about judgment. In a good message about spiritual warfare, by our Senior Pastor, William Hohman, he put it this way (more or less): conviction and condemnation feel the same. The difference is condemnation (or some would say judgment) says, “you are wrong, you are in sin, you are going down, you are bad and going to hell,” while conviction (Godly judgment) says, “you may be doing wrong, but turn from your sin and your life will be better, God still loves you and there is hope for you.” Can you see the difference? We don’t want to condemn people. That’s what Matthew 7:1 means. Even Jesus said he came not to condemn the world. Our days left here are getting shorter. God loves everyone and want them all to belong to his family. In Luke 11:23, Jesus says, “He who is not with Me is against Me, and he who does not gather with Me Scatters.” How can we help those who need Christ if we aren’t willing to tell them that they have a need? Can we generically tell people God is good, God is love but not say God is Holy, God is just? Sin is sin people. Turning our heads or hiding our eyes from wrong in someone’s life doesn’t help them. They key is our motivation. If you just want to go around and tell people how to clean up their lives and not work on your own, then you are a Pharisee and Jesus told them they were whitewashed graves. Work at getting and keeping your own life right with God, but in Love and in Jesus name, tell people when they are wrong. I can’t help thinking about so many people that have fallen away because nobody wanted to confront their wrong thinking before it turned into wrong behavior. They won’t always listen, and you’ll hear “Don’t judge me,” more than you’ll want to, but somebody has to do it. I Corinthians 6:1-5 “Dare any of you, having a matter against another, go to law before the unrighteous, and not before the saints? Do you not know that the saints will judge the world, and if the world will be judged by you, are you unworthy to judge the smallest matters. Do you not know that we shall judge angels? How much more, things that pertain to this life? If then you have judgments concerning things pertaining to this life, do you appoint those who are least esteemed by the Church to judge? I say this to your shame. Is it so that there is not a wise man among you, not even one, who will be able to judge between his brethren? Acts 16:15 “and when she and her household were baptized, she begged us, saying “If you have judged me to be faithful to the Lord, come to my house and stay.” So she persuaded us. I Corinthians 5:1-3 “It is actually reported that there is sexual immorality among you, and such sexual immorality as is not even named among the gentiles-that a man has his father’s wife! And you are puffed up, and have not rather mourned that he who has done this deed might be taken away from among you. For I indeed, as absent in body but present in spirit, have already judged (as though I were present) him who has done this deed.